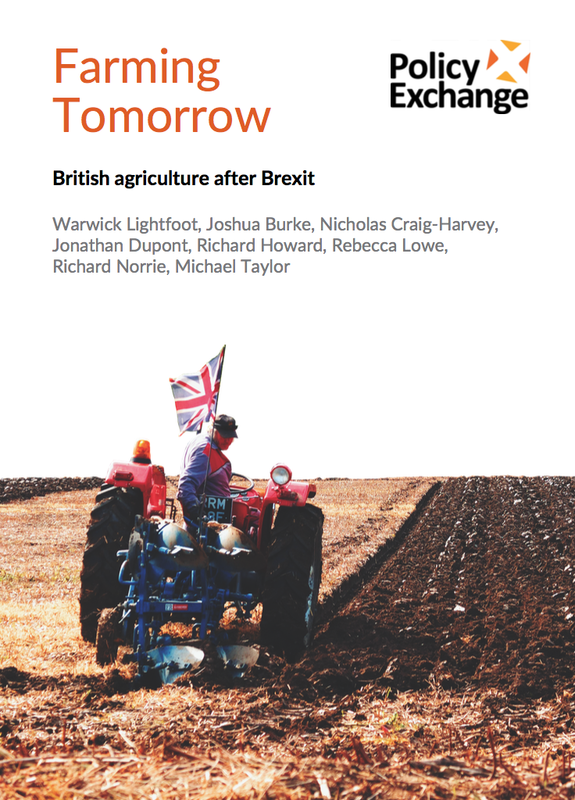 On the 1st August this week a think tank, Policy Exchange, published a report entitled Farming Tomorrow: British agriculture after Brexit. You can download the report from here. ‘Policy Exchange is the UK’s leading think tank. We are an educational charity whose mission is to develop and promote new policy ideas that will deliver better public services, a stronger society and a more dynamic economy. Registered charity no: 1096300. According to Wikipedia Policy Exchange is a British centre-right think tank, created in 2002 and based in London. It has been variously described as, “the largest, but also the most influential think tank on the right”, in the Daily Telegraph, and as, “a neo liberal lobby group funded by dark money”, in The Guardian. Interestingly Michael Gove, the Secretary of State for the Environment was instrumental in setting up Policy Exchange in 2002 and was its first chairman. 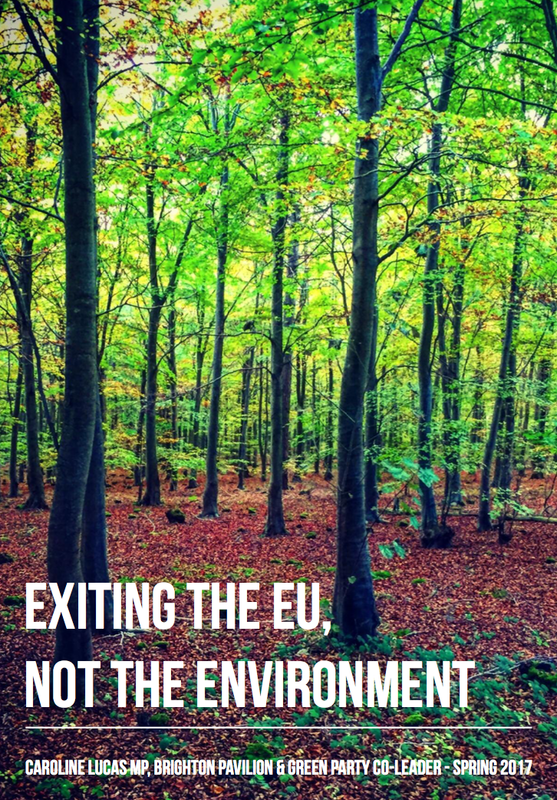 Even more interestingly Michael Gove’s recent speech on environmental policy ‘The Unfrozen Moment – delivering a green Brexit’ (download here) practically mirrors the ethos of the Environment section of the Policy Exchange document. Gove has been more circumspect about exactly what Brexit might mean for agriculture other than saying that in the future ‘support can only be argued for against other competing public goods if the environmental benefits of that spending are clear’. Perhaps the Policy Exchange document gives us an insight into what Farming and Food Green paper might contain? The document contains 6 chapters and an Executive summary. In the Introduction the authors argue against a British Food Policy based on Food Security and self-sufficiency, arguing that World free trade will provide us with our needs and suggesting that a policy of self-sufficiency would lead to even greater environmental damage. Such views are not uncontested. Jay Rayner in his 2013 book ‘A greedy man in a hungry world’ argues that with the rise of the middles classes in China, India and Indonesia many of the markets that would have traditionally supplied British supermarkets are turning their attention to these new emerging markets which will make it potentially more difficult for Britain to source its food at low prices. 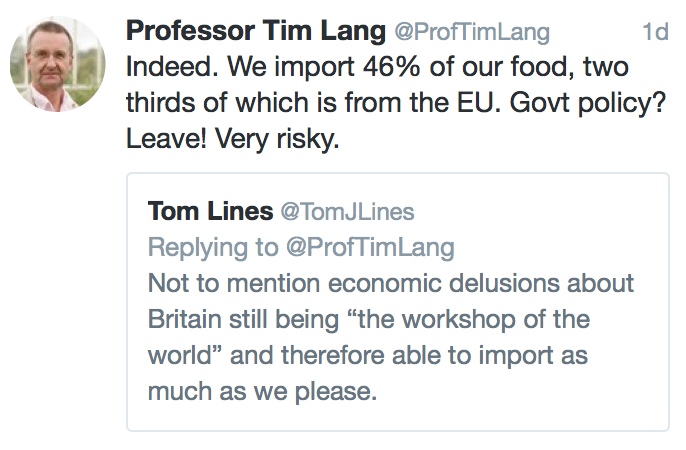 Tim Lang, Professor of Food Policy at City University London tweeted the following yesterday which highlights his concerns of the proposed strategy. 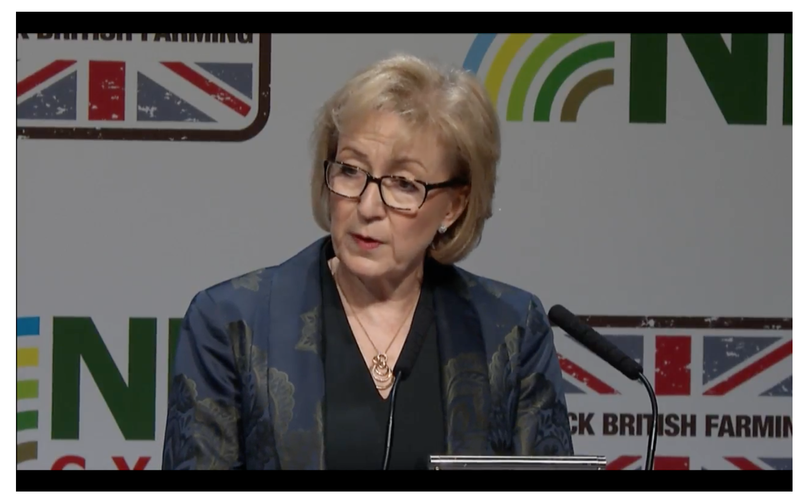 The Policy Exchange position certainly seems to support the views of the previous Environment Secretary Andrea Leadsom when she spoke to the NFU in February this year (see here). There is a full chapter in the report on agriculture in Britain from the ‘Corns Laws to the CAP’, of course repealing the Corns Laws in 1846 opened up tariff free trade and British agriculture acted as a free market with little government intervention, subsidy or protection. It would appear that we are heading back at least metaphorically to 1846 but on this occasion without an Empire or a navy that ruled the waves. The final four chapters cover consumers, producers, the rural economy and the environment. Policy Exchange state that the most important stakeholder in food and farming is the consumer and that they want inexpensive, high quality, safe food which is available in the right quantity at the most convenient time and place. This chapter also addresses the issue of food standards and discusses the controversies around chlorinated chicken, hormone-treated beef and Genetically Modified and genetically edited food. The authors seem to be suggesting that there is no evidence that these practices threaten human health but have been banned by the EU on the grounds of the ‘Precautionary Principle’. The Consumers chapters ends with the following two recommendations, you can make of the second one what you want! The Food Standards Agency should be given new powers and resources to collate, commission, and review scientific evidence on food safety and animal welfare. This is a brutal section as it discusses the decline of British farming over the years, it takes no prisoners and offers no solace. The chapter suggests that UK farming income in 2016 was £3.6b which included £3.1b in subsidies so actually farming only made a profit of £500m. Indeed they also suggest that between 1997 and 2007 farming profit was below the subsidy level so in effect agriculture produced a negative effect on the economy overall. The recommendations from this chapter puts much of British agriculture to the sword. The UK should work to phase out direct subsidies for agricultural production and income support. This will free up Government revenue to fund other taxpayer priorities, such as the NHS. Any remaining subsides should be redirected towards protection for natural and public goods, and increasing R&D to boost innovation and the sector’s long-term productivity. The Government should work to identify environmentally suitable freed-up land that can be used for housing or commercial development, sharing the planning uplift with the original farmer. Subsidies should be phased out gradually over a five-year period from 2020, with farmers given the option of receiving a final payment as a single one-off payment instead. Seeking self-sufficiency in food should not be a goal of agricultural policy. This section challenges the accepted wisdom that agriculture is a core part of the rural economy. The authors state that in terms Gross Value Added agriculture, forestry and fishing represent just 2% of the rural economy. Conventional economic statistics only capture a limited proportion of the value created by rural areas, much of which takes the form of positive externalities. The ONS’s preliminary work on natural capital identifies as many as 29 separate mechanisms by which the natural environment can create value, including: agricultural production, timber, wind power, wildlife, air pollution removal, waste water cleaning, flood protection, scientific, and scientific and educational interactions. 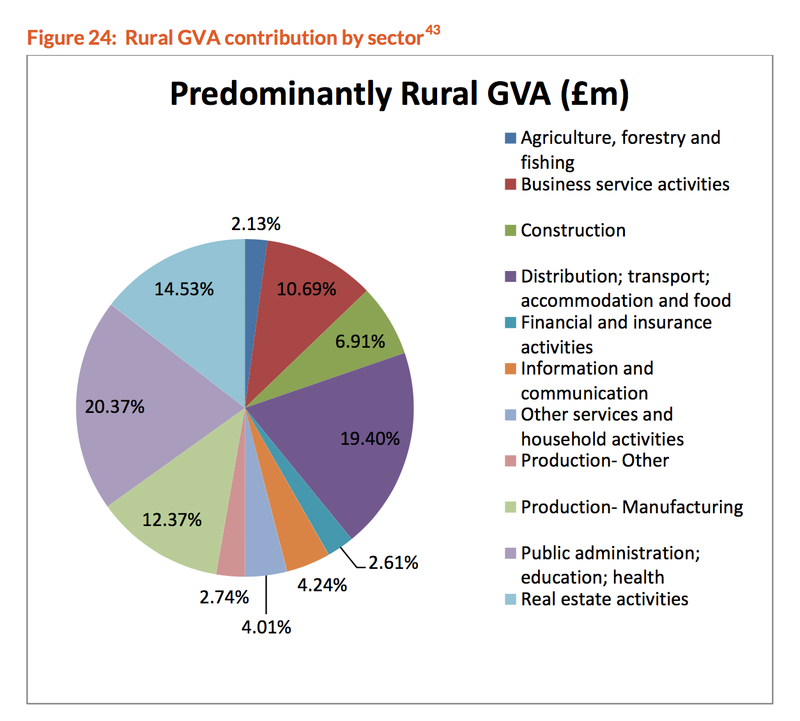 The recreational value of day trips alone to the natural environment was estimated to be £6.5 billion — not far below the entire GVA of agriculture. Post-Brexit environment policy should be one of gardening: managing for a diversity of outcomes in different places. Productive farms here, deep forests there, wild moorlands elsewhere. Freed from the one-size-fits-all shackles of the EU, we should localise our policies, and host as many habitats and species as the climate will support. The text suggests that many current agricultural workers could in effect become ‘gardeners’ tending natural capital via payments for ecosystem services. But in a world such as this what about farming? Here the authors argue that British agricultural should move away from its productionist past and through innovation become a world leader in AgriTech (Tim Lang and Michael Heasman in their 2015 book Food Wars call this the Life Science Integrated paradigm). This is the world of biotechnology, GM and the use of enzymes, robot driven tractors, precision drilling, fertilising and pesticide application , the use of ‘big’ data and drones. Some will be able to go down this route but not everyone ……. Here are the recommendations from the Rural economy chapter. 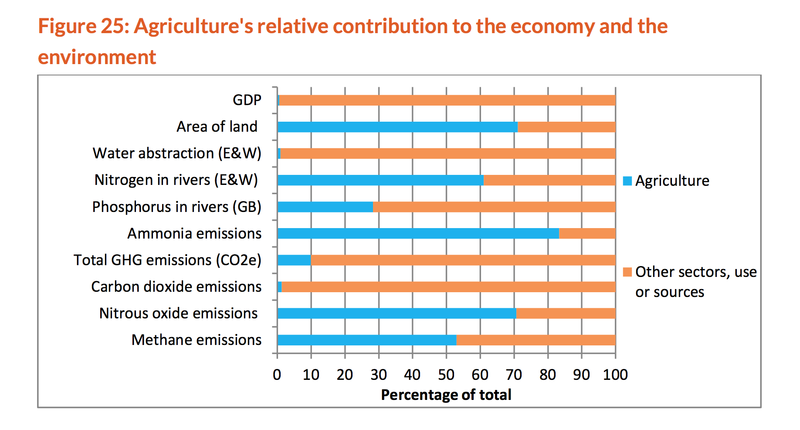 This section sets out that agriculture dominates land use and the current model of exploitation is simply unsustainable. Rather than giving production subsidies to farmers under the CAP, all remaining public support should go towards public goods, such as preserving and enhancing the natural environment and the environmental and aesthetic benefits that derive from it. This should be achieved using a ‘Payments for Ecosystem Services’ approach, linked to the Defra 25 Year Environment Plan and the work of the Natural Capital Committee. Payments should be available both to farms and other landowners, creating a competitive market for the provision of ecosystem services. As part of Defra’s 25 Year Plan for the Environment, Government should consult on the most appropriate mechanisms for commissioning ecosystem services (including consideration of the optimal scale), and explore how they could work alongside tools such as regulation and biodiversity offsetting. Develop an integrated land management policy framework, which facilitates the deeper integration of forestry and agriculture. Explore the potential of re-forestation as a cost-effective approach to mitigating carbon emissions. Perverse EU rules such as the crop diversification rule should be reformed or abandoned. Transpose the key environmental directives that govern the environment — notably the Water Framework Directive, and the Habitats Directives — so that there is no post-Brexit period in which no laws apply. The report finishes as follows. As described above, Payments for Ecosystem Services can be used to achieve a range of environmental benefits, such as carbon sequestration, improving water quality, reducing flood risk, or improving the landscape. For other goals, where valuation is harder, regulation may be more efficient. In this context, who will decide what outcomes are desired, and in which locations? Will different locations pursue different objectives? What is the approach scale to make these decisions? As a practical example, consider the Lake District — recently identified as a UNESCO World Heritage Site. The Lake District is regarded as having a landscape of great beauty, in particular its cultural landscape. The current landscape is the product of centuries of human management, in particular of upland sheep farming, which has resulted in deforestation and relatively low levels of biodiversity. In the post-Brexit farming policy framework described in this report, should this landscape be preserved as it is to maximise its cultural and heritage benefit? Or conversely should it be ‘re-wilded’, as suggested by some commentators, and returned to nature to maximise its biodiversity and wider environmental benefit? These are the sorts of difficult decisions that will need to be made in the creation of Defra’s 25 Year Plan for the Environment. So does this document contain the blue print for the Defra 25 Year Plans for Farming and the Environment? Of course we will have to wait and see. This neoliberal future certainly appears to offer huge opportunities for the environment but at what price to farming? The report openly talks about re-structuring the industry – this means forcing uneconomic businesses off the land freeing it up for other uses such as housing and re-wilding. What does it mean for Dartmoor? It would appear that the money will be there for hill-farmers but will this be for livestock production or their potential future new role as ‘gardeners’? Polly Toynbee, writing in the Guardian (see here) has said ‘no wonder farmers fear the Brexit wolf in sheep’s clothing. Most farmers voted leave. Now they are beginning to dread the withdrawal of EU subsidy and see their traditional protectors in the Tory party as enemies’. The National Trust’s Director General has also joined in the debate saying that the ‘countryside faces damaging uncertainty unless the current level of subsidies are maintained for farmers. The Trust said affordable, high-quality food and wildlife-friendly farming can be secured for the current subsidy of £3bn a year (see here). Finally, Vernon Bogdanor, Professor of Government at Kings College London has raised the prospect of the need for a second referendum (see here) ‘Brexit after all raises fundamental, indeed existential, issues for the future of the country. That is why the final deal needs the consent not only of parliament, but of a sovereign people’. So much up in the air, so many lives in limbo, one person’s threat is another’s opportunity. Today sees the beginning to the NFU’s 2 day annual conference, being held in Birmingham. 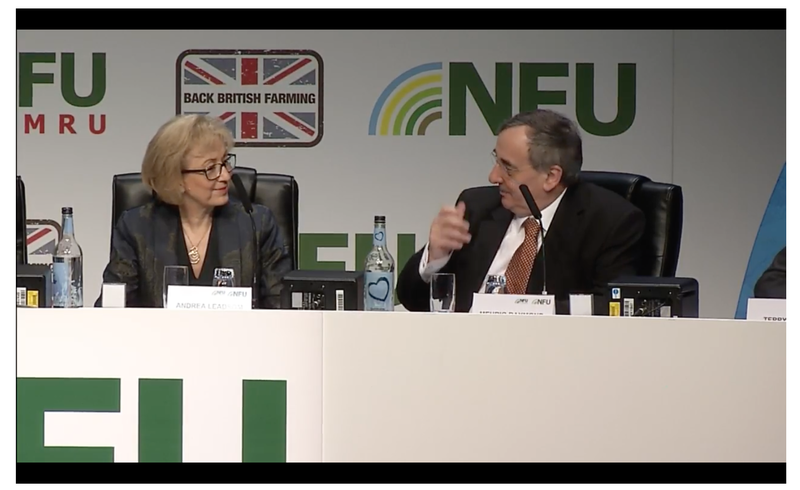 The event started with an opening address from NFU president Meurig Raymond which was then followed up by a speech from the Defra Secretary of State Andrea Leadsom. It wasn’t long before Raymond was asking for more action on badgers and bTb including an extension of the geographic area where culling could take place. He then went on to make an impassioned plea to allow the continued us of glyphosate. 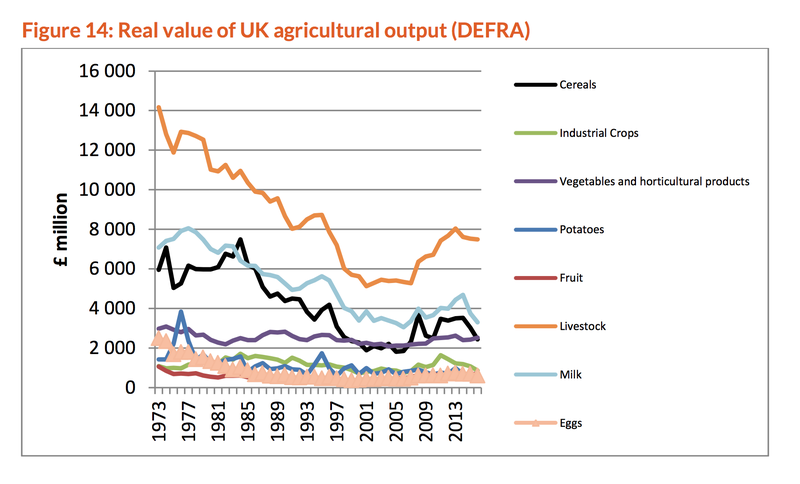 He talked about a new report that the NFU had commissioned ‘Contributions of UK Agriculture’ by Development Economics which suggested that for every £1 invested in British agriculture the country saw a return of £7.40 – you can download the report here. This led him to call for continued farm support / subsidy post 2020. 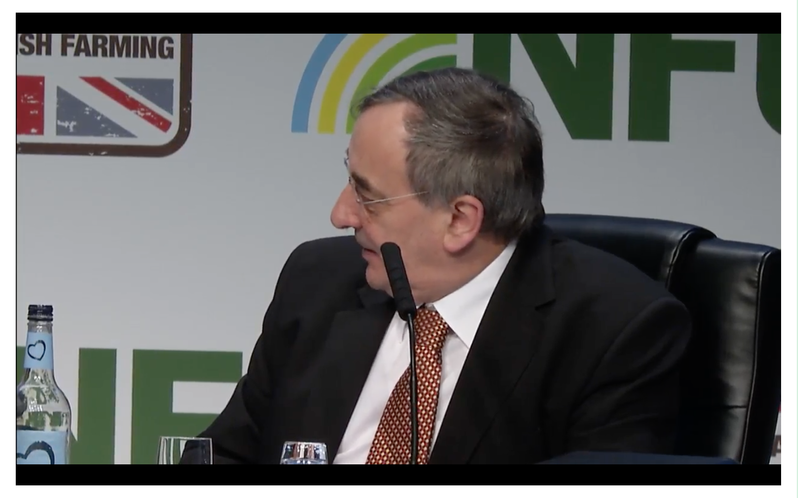 A classic NFU / Raymond performance which left me feeling rather uncomfortable, the implication being that if the Government doesn’t listen, then the farming industry will face disaster. You can read his full speech here. Trade – tariff-free and frictionless cross-border trade with Europe. Regarding the Brexit negotiations she said “Those negotiations will take time, and change is, of course, inevitable”, prepare yourselves the status quo will not continue. About the call for seasonal workers she said “we mustn’t forget that a key factor behind the vote to leave the EU was to control immigration”, you can read into that what you will, but I took it to mean that agriculture was going to have to find new ways of solving this problem, she later alluded to the use of new technologies. When talking about future policies for farm support / subsidies she said “And how do we devise a system of support that properly takes into account the diverse types of farming, and the challenges unique to each? So, for example, how can we ensure a more tailored approach – one that recognises the needs of hill farmers alongside those of arable farmers and protects our precious uplands as well as our productive fenland?”. The use of the language ‘precious uplands’ is important and I think signals again that hill-farmers will be supported in return for looking after the uplands. Interesting she also mentioned the protection of our ‘productive fenlands’ I have written before about how intensive agriculture in the fens is leading to the wholesale loss of the peat based soils (see here). Is this remark a signal that in future these soils must be conserved and not just allowed to oxidise and blow away? This is the clearest articulation of ‘public money for public goods’ stated by Defra to date. I predict a battle royale now between Defra and the NFU. Yes, Defra will negotiate for access to the Single Market – tariff free, but they won’t cave in over migrant labour and future farm support will be for ecosystem services. This is not what the NFU wanted to hear but in return Defra will sweeten the bitter pill by extending the badger cull, permit the continued use of glyphosate, will provide bridging loans for those yet to receive their Basic Payment Scheme money and in some circumstances pay farmers who allow their land to flood under the auspices of ecosystem services. I will be interested to see if anyone else has this take on the two speeches! The first of these is ‘Exiting the EU, Not the Environment’ written by Caroline Lucas MP with the help of David Baldock and the Global Justice network. It summaries 10 environmental challenges and then sets out a 5 point ‘Green Guarantee. The report concludes by listing 153 (out the 1100 EU pieces of legislation which Defra will have to navigate across to UK legislation if there is to be no reduction in environmental protection for the UK once we leave the EU. It is a very good document whatever your political persuasion – you can download it here. It should be required reading for all those interested in Brexit environmental politics. The second report is for the House of Lords European Union Committee and is entitled ‘Brexit: environment and climate change’. The Department for Environment, Food and Rural Affairs (Defra) faces an enormous challenge as the UK approaches Brexit. Together with the Devolved Administrations, it is responsible for repatriating and replacing the Common Agricultural Policy and the Common Fisheries Policy. Alongside the Department for Business, Energy and Industrial Strategy (BEIS) it must also map the extent to which environmental and climate change policies can be preserved through the Great Repeal Bill. Furthermore, Defra will need to design regulatory structures to ensure that environmental protections are enforced as effectively after Brexit as before. Resolving the tensions inherent in these competing tasks will be vital if the Government is to deliver on its commitments to leave behind a better environment than it inherited. There is a lot to be done ……. 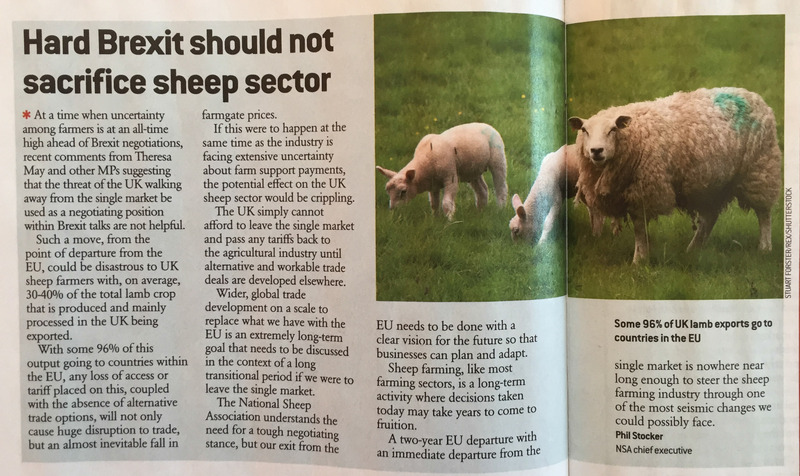 There is a letter in today’s Farmers Weekly by Phil Stocker of the National Sheep Association about how the sheep sector could be seriously affected by a hard Brexit and the loss of subsidies. 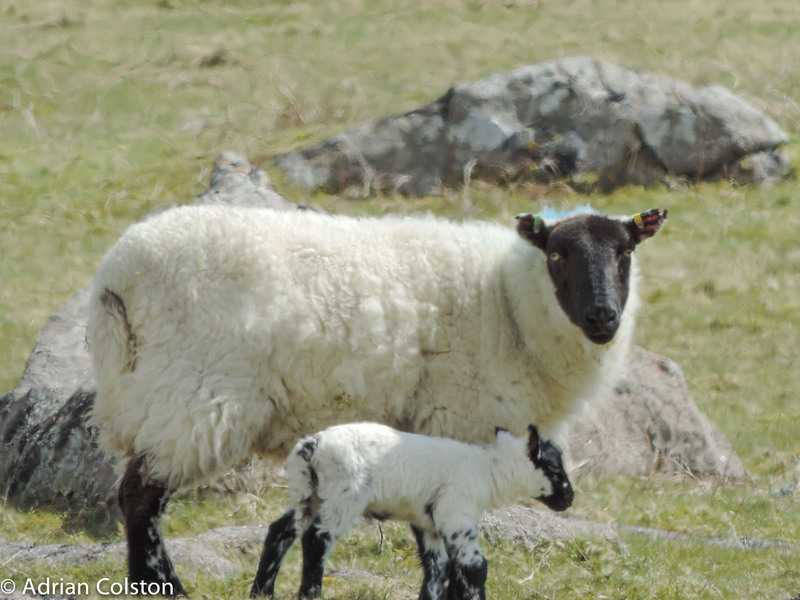 Last year the NSA published a document about sheep in the uplands – I don’t agree with all of it but it is good and worth a read – download it here. I went deliberately to Waitrose yesterday in search of some English lamb mince – what I thought would be straightforwards turned out not to be so. No English lamb at all of any sort was to be found, instead the shelves were full of New Zealand lamb …… This led me to investigate why this might be. It is quite complicated! Firstly as a nation we don’t eat that much lamb and mutton – apparently about 5kg per person per year – see here, and we are basically self sufficient in lamb. Defra told us that the national sheep flock in 2015 was estimated to be around 23.1 million animals – see here and Monbiot calculated that sheep occupy around 4 million ha. of land – the majority in the uplands – see here. So if we are self sufficient in lamb why do we import lamb from New Zealand? Firstly UK sheep farmers export around the same amount of lamb / sheep products as the UK imports (which mostly comes from NZ). So if we didn’t import lamb there wouldn’t be the supply to meet the demand. Secondly lamb is a seasonal product, the UK is in the northern hemisphere whilst of course NZ is in the southern hemisphere. As a result their seasons are complimentary. UK lamb is mainly available from June – December, whilst NZ lamb is in season from December to early June. Thirdly, as a nation we are rather fussy about what cuts of lamb we like to eat, we tend to prefer legs and chops, as the result of this the rest of the meat cuts and products are exported to countries abroad where ‘lesser’ quality cuts are eaten. In addition much more lamb is eaten that mutton in the UK. Fourthly, is the issue of currency rates. When Sterling is strong then lamb is uncompetitive on the continent and UK exports drop. 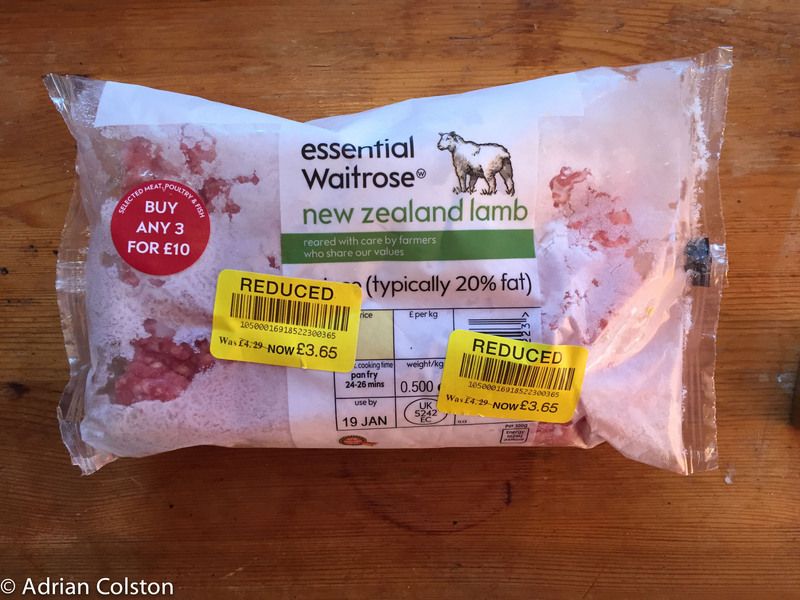 However when Sterling is strong, this is the time when NZ wants to export lamb to Britain as they get good prices for their products, leading to a potential conflict with UK farmers – see here for an example from Wales. Conversely when Sterling is weak (as now) lamb becomes competitive on the continent and exports rise, but imports from NZ drop. Lamb is a favourite Easter food and of course at this time UK lambs are still growing on the hills and in the fields so the lamb that is available is from NZ and this has led to people asking why UK supermarkets don’t stock UK lamb – see here. Interesting! But there is more …..
People often complain that lamb is very expensive and why should this be the case? Well a comparison with pigs and pork explains quite a lot. The average sow produces 8 piglets on a four month cycle and each piglet after 5 months will weigh 250lbs and can go to market. Pigs can be kept in a pen measuring 30 x 30 feet. By comparison a ewe can produce 1 – 2 lambs per annum and needs 0.75 acres per animal. Finally, look how this might change after Brexit – the pound is now very low compared to where it was 7 months ago so conditions are ideal for UK farmers to export to the Continent and elsewhere – both markets come courtesy of the EU Single Market. If negotiations to secure exporting access to foreign markets takes many years then UK farmers won’t be able to export. The strategy for sheep farming may then have to change – one option might be, especially in the lowlands, to produce lambs which are less seasonal. For example Dorset Breed sheep can produce lambs throughout the year so an increase in this breed might allow lamb to become available all year round. In case you missed the fuller details here is the 12 point plan that Theresa May announced yesterday regarding the UK’s decision to leave the EU – entitled ‘Plan for Britain’. Pretty disappointing not to see either the environment or climate change specifically mentioned. The New Economics Foundation published a short response to the speech – here and it suggested that the government’s plan would lead to reduced workers’ rights and watered down environmental protection. Quite a lot of people on Twitter were suggesting that May was trying to ‘have her cake and eat it’, but I guess you have to start the process somewhere. 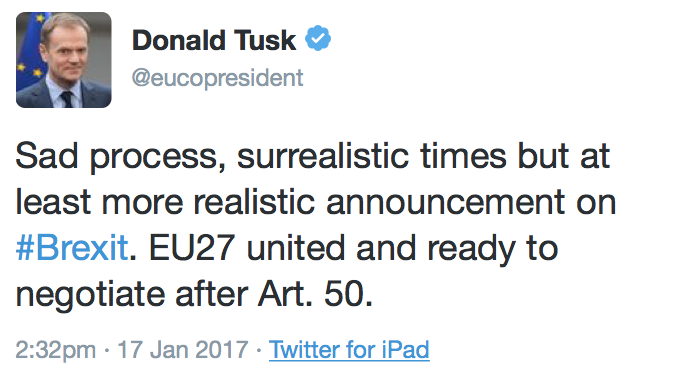 There is a long process ahead now and let’s hope it doesn’t just lead to a cliff edge.